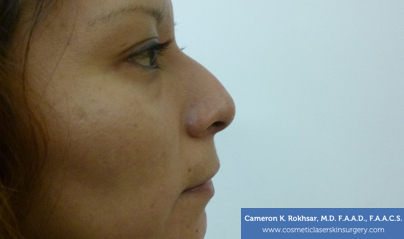 A nose bridge bump is a very common aesthetic facial disproportion that is usually a result of hereditary development in which there is an overgrowth of nasal cartilage and bone that leads to the bump on the bridge of the nose. Aside from genetics, traumatic injury to the nose suffered during adolescence or childhood development can result in overgrowth of the bone and cartilage as well. 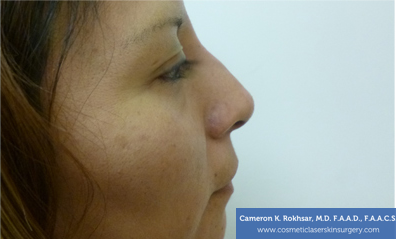 The nasal bump is often corrected using rhinoplasty. Dr. Rokhsar is the inventor of the nonsurgical nose job and has the expert guest on shows such as USA Today, and has written several chapters in texts on this subject as well as the first to publish a scientific paper on nonsurgical rhinoplasty. His expertise in this field will provide the patient with reassurance that their desired results will be achieved. To view more, check out our full gallery! This is a 35 year old complaining of a crooked nose after a nose job. I was able to correct her deformity with fillers doing the non surgical nose job in a matter of 10 minutes. Check out our full gallery! View more cases in our gallery, complete with before and after photos, information about the case, and detailed stories. 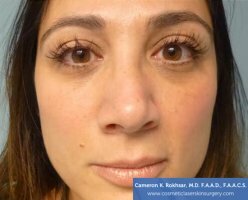 Dr. Rokhsar can perform rhinoplasty, also referred to as a nose job, in order contour the nose into a desired shape and is also used to correct structural problems that can cause chronic congestion and breathing problems. This surgery approves the appearance and proportion of your nose, enhancing facial symmetry and decreasing structural abnormalities. During rhinoplasty surgery, local anesthesia is administered and incisions are made to access the bones and cartilage that support the nose. Depending on desired results, some bone and cartilage may be removed and/or tissue may be added and the nose is recovered with its skin and a temporary splint is placed outside the nose in order to support the new structure while it heals. Puffiness and bruising will remain for up to two weeks while the body heals, and cold compressions are encouraged for a more effective and quick healing process. Those that are surgery averse can opt for the non-surgical nose job which users a filler substance, such as Radiesse or Juvederm, that is injected through controlled precision to reduce dents, bumps and deviations, including a droopy nose. The procedure is significantly shorter than surgery and requires no downtime. The results can last up to two years. 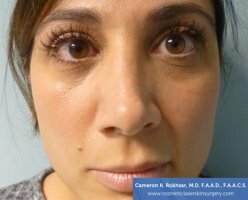 Dr. Rokhsar is the first to write a scientific paper on non-surgical nose job and has perfected the technique.